Once a year Parkes, a sleepy mining town in rural Australia, explodes into color and song-a veritable Graceland in the outback hosting a five-day extravaganza to celebrate ‘the King’. 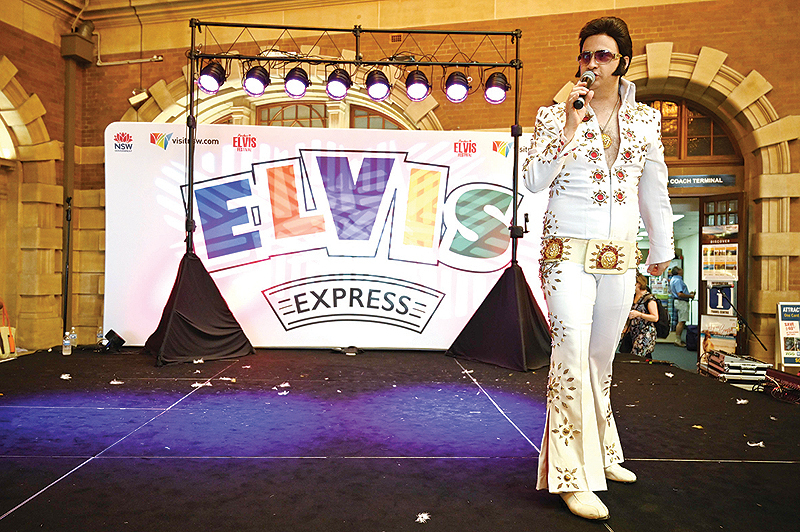 Die-hard fans don their polyester jumpsuits, thick black wigs and gold-coloured necklaces, hopping on the “Elvis Express” and “Blue Suede Express” trains to the event, now billed as the southern hemisphere’s biggest tribute to the superstar. 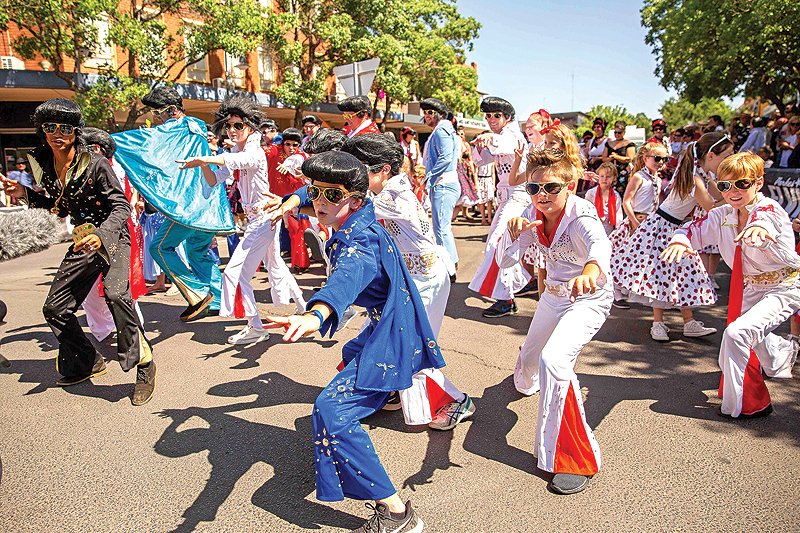 The town’s transformation extends beyond the superficial-organizers estimate this year’s Parkes Elvis Festival generated Aus$13 million (US$9.3 million) for the local economy as more than 27,000 people visited attending some 200 themed events. “It’s just crazy,” said North Parkes Motel owner Andrew Porter of the frenzied growth in tourists. “It’s just gotten busier and busier over the years. It’s helped the whole economy,” he added. Elvis, who died in 1977 aged 42, never travelled to Australia and the event, held to coincide with his January birthday, runs at the height of summer when temperatures top 40 degree Celsius (104 Fahrenheit). 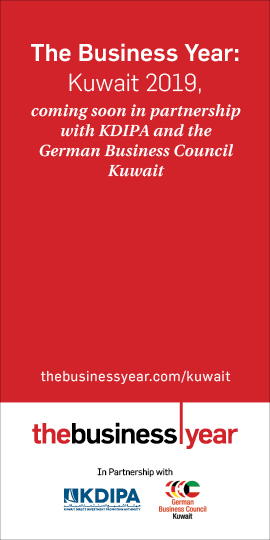 But neither fact deters the fans: What was a sleepy summer period has turned into full occupancy during the festival. Accommodation is fully booked years in advance, caravan parks fill up quickly and sporting fields are packed with tents. “A lot of people do come here and they spend a hell of a lot of money. I know that for a fact,” said Elvis Lennox, who changed his name from Neville Steven and has a huge collection of memorabilia that he exhibits in a private museum. Parkes, which is some 300 kilometers (190 miles) west of Sydney, began as a gold-mining town before becoming a flourishing farming community. But by the 1990s, it and similar rural towns began to struggle as agricultural work declined. Keen to draw in more customers during the quiet summer, when even townsfolk flee to the coast to get relief from the heat, restaurant owners Bob and Anne Steel organized a birthday party for their idol. The first Elvis celebration in 1993 drew 200 participants, and the Steels had so much fun they made it an annual event. At first there was little impact on the local economy, town mayor Ken Keith said. But as visitor numbers rose, so did revenues. 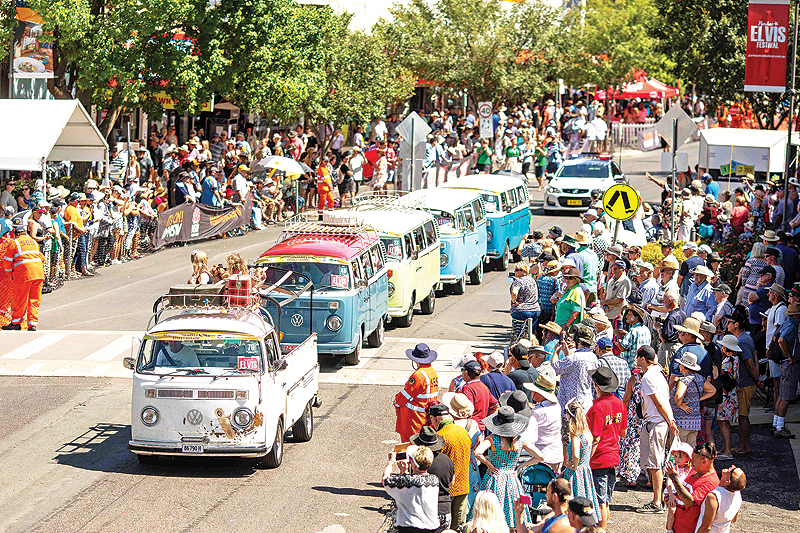 Parkes is now so full that towns up to two-and-a-half hours drive away have started to cash in by offering accommodation and transport for revelers who missed out on a place to stay near the festival. “They get up at 5am, travel to Parkes to be here at 7am, leave here to go back after shows at midnight. It’s a big toll but they do it. It’s Elvis himself that’s drawing them here,” Lennox added. The New South Wales state government is projecting an injection of Aus$43 million into the wider region surrounding Parkes this year due to the festival, a much-needed source of income amid a severe drought. While locals still get work from the farming, mining and transport sectors throughout the year, the event has helped develop Parkes’ service economy-and its numbers. The population has increased by four percent to around 12,000 in the past decade, according to the Australian Bureau of Statistics, in sharp contrast to the declining or static trend in other regional and rural towns. Parkes has become a model for how rural regions can re-invent themselves, said University of Wollongong human geography expert Chris Gibson. Inspired by the success, other small towns have started their own events such as the ABBA Festival in nearby Trundle and the Bob Marley Festival in Kandos, said Gibson, who has compiled a database of some 2,800 festivals across the country. 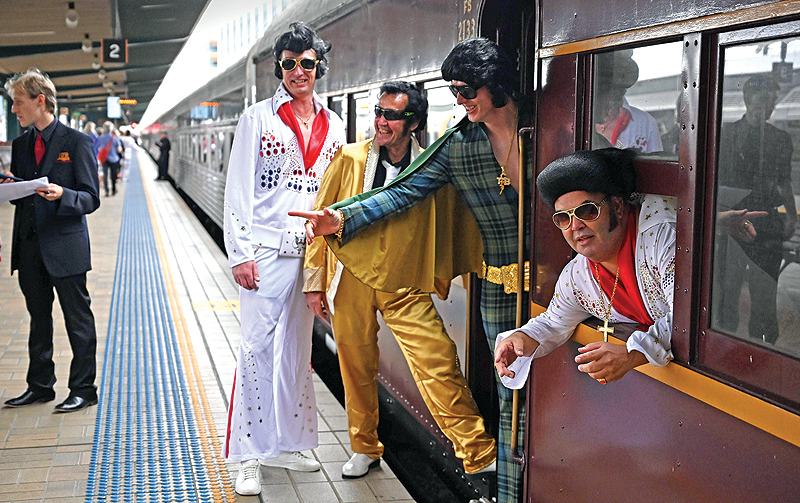 The Elvis festival has a uniquely Australian flavor. “We don’t take ourselves too seriously,” said Keith, decked out in a sky blue jumpsuit, aviator sunglasses and pompadour wig as he danced with jumpsuit-clad Deputy Prime Minister Michael McCormack ahead of the event’s street parade.